Emphasizing that administrative law must be understood within the context of the political system, this core text combines a descriptive systems approach with a social science focus. 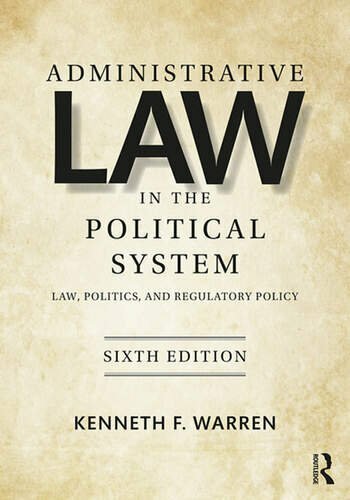 Author Kenneth F. Warren explains the role of administrative law in shaping, guiding, and restricting the actions of administrative agencies. Providing comprehensive coverage, he examines the field not only from state and federal angles, but also from the varying perspectives of legislators, administrators, and the public. Substantially revised, the sixth edition emphasizes current trends in administrative law, recent court decisions, and the impact the Trump administration has had on public administration and administrative law. Special attention is devoted to how the neo-conservative revival, strengthened by Trump appointments to the federal judiciary, have influenced the direction of administrative law and impacted the administrative state. Administrative Law in the Political System: Law, Politics, and Regulatory Policy, Sixth Edition, is a comprehensive administrative law textbook written by a social scientist for social science students, especially upper division undergraduate and graduate students in political science, public administration, public management, and public policy and administration programs. Kenneth F. Warren is Professor of Political Science at Saint Louis University, USA, where he teaches and conducts research in the area of American politics. President of the Warren Poll for over two decades, he also conducts polls for the media, government, private clients, and politicians. He has served as a political analyst for local, national, and international media for thirty years, appearing in the New York Times, the London Times, the Wall Street Journal, and the New Republic, and on most major television networks.